Last week marked the 124th birthday of Marjory Stoneman Douglas (Class of 1912), a woman who dedicated her life to advocating for the environment, for racial justice, and for other women. Douglas was one of the earliest champions of protecting the Everglade forests in Florida, and wrote one of the defining texts on the subject, The Everglades: River of Grass. In the spirit of Douglas’ activism, Wellesley students recently traveled to the Everglades and Biscayne National Parks as part of the Alternative Break (AB) program; another group focused its work in Maryland at the Mid-Atlantic Border Collie Rescue organization. Sponsored by the Center for Work and Service, the program engages participating students in all sides of a social issue through traveling to volunteer with a nonprofit organization in a different part of the country. Upon return, students will be empowered to make more informed decisions and take meaningful action that supports a greater good. Victoria Rines ’15 and Connie Rojas ’15 led the group of student volunteers at the Everglades National Park and Biscayne National Park. The group partnered with the National Park Service to preserve and restore the unique ecosystems in the parks, and to educate visitors on environmental stewardship and human impact. 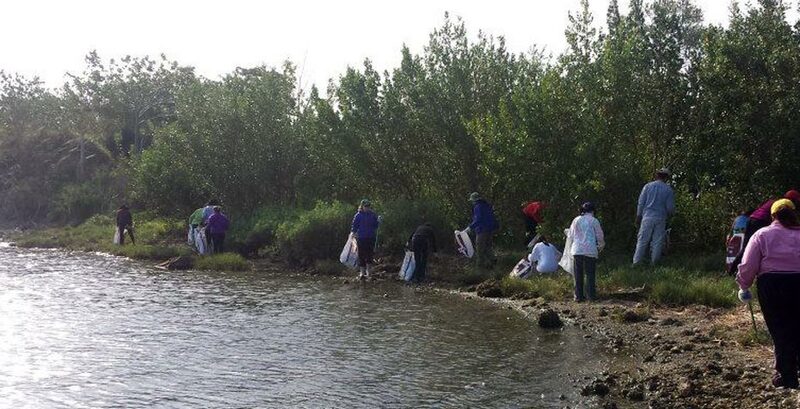 At Biscayne, for example, they were tasked with cleaning up trash along the beach, canals, and mangrove swamps. “The sheer amount of trash was absolutely overwhelming,” says Rines. “The mangrove forest, which is an important habitat for a number of species in Southern Florida, was littered with every item imaginable: shoes, water bottles, beer cans, gardening buckets, basketballs, tires, rusted car parts, candy wrappers, plastic bags, fishing poles, rope; you name any object, and we likely saw it in that mangrove forest.” The Wellesley group filled 32 garbage bags, amounting to 900 pounds of trash, in a single afternoon. The other Wellesley group traveled to Maryland where students volunteered at the Mid-Atlantic Border Collie Rescue, a nonprofit organization that cares for neglected and abused border collies. Annie Wang '14 and Jane Pak '16 were the student leaders in charge of the trip. The deadline for students to sign up for next year's Alternative Breaks is fast approaching. Applications for Student Coordinator positions and Site Leader positions are due on April 22 at 12 noon through MyCWS. “These positions are great opportunities for students to really shape the Alternative Breaks program at Wellesley and to gain hands-on leadership experience through service,” says Jordan Greenwood, the CWS graduate assistant. Greenwood gives this quick synopsis of the roles: Student coordinators work closely with the service program director and site leaders; students who have previous experience in a leadership position, experience with community engagement or outreach, or have participated in an Alternative Break before are encouraged to apply as a student coordinator. Students who are familiar with service or community work and possess demonstrated leadership are encouraged to consider applying for a site leader position.